When a tree becomes bottom heavy (this means the lower part becomes thick and unruly) you need to lift the ‘crown’ to help with access and the natural development of the tree as it ages. J E Varley provide ‘crown listing’ services throughout Yorkshire. Our team will assess how heavy the tree is at the lower parts and then remove the base elements to effectively raise the profile of the tree. With over 20 years experience providing both residential and commercial clients with crown listing services we are the experts in the removal of lower branches. 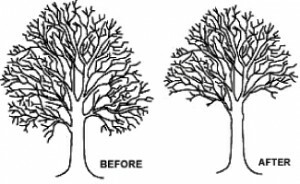 We understand that the removal needs to be carefully and thoughtful to the natural look and feel of the tree, this means we take a step back and shape it according to the surroundings and natural appearance of the trees in the area. If you’re looking for a crown lifting tree surgeon speak to the J E Varley team.